I started carrying a wallet (in my back pocket!) when I was about 12 years old. I still carry a wallet now that I am a bit older (ok ok, yes quite a bit older! ), although I carry it in a front pocket to keep it safe. That is basically what a wallet does right? Keep your valuables safe? That is where I keep my USD and credit cards and the same goes for digital assets like Bitcoin or Ethereum. Keep reading for my favorite wallet and a beginners explanation of what a crypto wallet is. A digital "wallet" is a place to keep your cryptocurrency. If you want to own or use Bitcoin (or any other altcoin) you will need a wallet to manage them. I will keep things simple and just go over the basics and then give some recommendations on my top wallets of 2018. A wallet works by managing access to your cryptocurrency on the blockchain by using a pair of "keys". There is a Public Key and also a Private Key, these work in conjunction to secure your crypto so only you can have access (see my article about Basic Crypto Terminology for more on keys). People send you cryptocurrency to your Public Key, but you keep the Private Key safe and never give it out. There are many many different options out there for wallets, as well as different types of wallets. 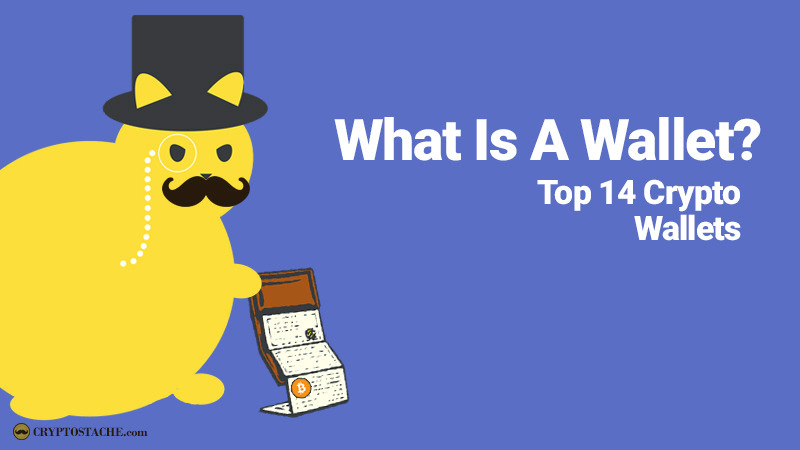 There are basically 5 major types of wallets that we will go over and they include Web Wallet, Desktop Wallet, Mobile Wallet, Hardware Wallet, & Paper Wallet. Each type has it's advantages and some programs fall into multiple categories even! Depending on what type of trading or investing you do, one or more of these wallets are worth giving a try. Right now my current favorite wallet (and the one I use on a daily basis!) is the Exodus wallet. 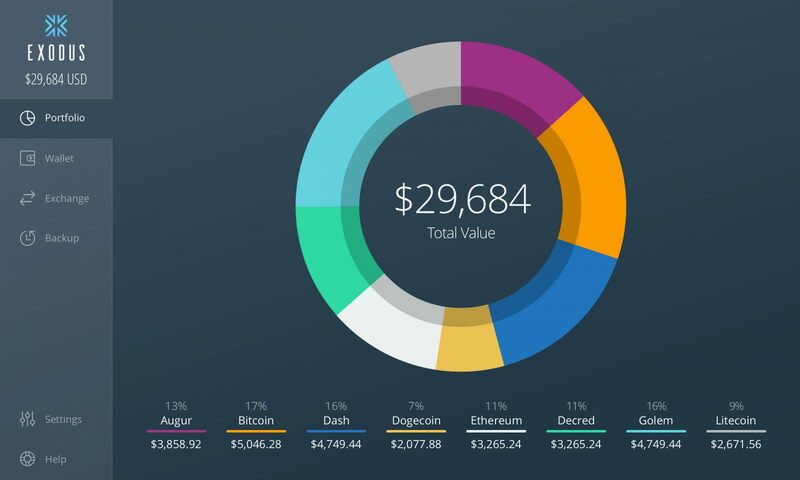 They have done a fantastic job making it easy to see your investments, they support a good amount of coins, great UI, you can convert between 2 coins very easily with Shapshift, and the list goes on. It is a Desktop ONLY wallet, which I love, so that may be a downside for some. Electrum - This is another very popular desktop wallet. It also has a mobile app that you can download for both apple & android. Armory - Armory is similar to Exodus as it is a desktop only app. It is limited to Bitcoin only so there is a limitation there as well. Regardless it still looks like a decent option. Copay - I have not tried this one, but they have a desktop and mobile versions. The cool feature here is the fact that you can have multiple people on one account and they all can be required to sign off on a purchase or transfer. There are a crap ton of web wallets out there for just about every coin. Hundreds even. Here are just a few important ones. Coinbase - Coinbase is the largest US based company providing cryptocurrency services including a wallet. They support multiple coins and have a USD wallet as well as integrate with a bunch of different services and websites. The downside here is you don't fully hold your private keys and fees can be a bit steep, a great option still for the beginner. It's where I started! Blockchain.info - This is one of the most popular online wallets for Bitcoin and has been around for quite some time. Limited to Bitcoin only though. Meta Mask - Meta Mask is an Ethereum wallet and another one of my favorites. It is actually a browser extension for Chrome that works great and can hold all those ERC-20 tokens too. Mycelium - This is the number one mobile wallet and has been around for a long time. I still have not tried any mobile wallet, but this one has been trusted and soild so it would be a great place to start. Coinomi - I was surprised by how many different coins and tokens Coinomi supports. Along with some other great features you can find it on both apple and android. Jaxx - This is a newer mobile wallet, but has a lot of support from the community. The interface looks great! These are small devices (typically like a usb key sized) that hold your crypto so it is not even connected to a computer. This is a great solution if you are dealing with a large amount or want to keep your coins extra secure. Ledger - Arguably the most popular of the hardware wallets, the Ledger has a few models and they are all about the size of a usb key. I prefer the ones with the display on them. I will most likely be picking up one of these soon! Trezor - Trezor is another great product from all the reviews I have read, although I have not tried it. It's design is a bit different, but built on rock-solid technology. Certainly one of the most trusted brands out there. Keepkey - Another one of the top brands in hardware wallets which has a good selection of coins it holds and also offers Shapshift transactions in the software. Paper wallets are essentially your private and public keys printed out on a piece of paper. There are various ways to generate these (some people even us a "brain wallet" which is remembering a series of key terms), but I have only ever tried Bitaddress and it was great. Bitaddress - This a fast and easy way to generate one or even multiple paper wallets online for free. There are lots of options for wallets out there, and if you are going to buy or transfer Bitcoin (or any other Altcoin) you are gonna need the right type of wallet. Find the right wallet for you and make sure you can hold on to those Private Keys! Did not realise there were so many types of wallets. There are so many different kinds, and more are popping up. Cryptocurrency wallet does make it easy to use. Literally like using a bank account, maybe in an even more convenient manner.